Currently Crushing On – aug 15 2015. Oooooooooh hey. It’s the weekend! I’m pumped. I just about had a heart attack this past Monday when I saw on instagram that kids are going back to school. howwhatwherewhenwhy and why so early? Are you one of these people? Mind = blown. We never went back to school until at least the third week of August and every year around this time I get weird and anxious back-to-school feelings at the ripe old age of 32. That’s normal right. This past week I did SO much writing when I wasn’t doing so much mom-ing which was pretty much all the time. I secretly need to escape to Target because it’s been two weeks and well, I can’t go that long without being basic. What are your plans for this fine weekend in August? P.S. I fiiiiiiiinally did a baby max update the other day. slow down time!! P.P.S. if you want to see more of our weekend, be sure to follow on instagram and snapchat!! i declared the week over once i saw this no churn mascarpone soft serve. just totally dead. can you imagine doing this DIY sand art manicure?! patience please. this is totally one of my favorite salads ever too! so simple and wonderful. not that i can can (ha! can can) anything to save my life, but i’d like to try with this blueberry habernero jam. so interesting, right?! right this very second i have a huge ball of burrata in my fridge and it must be eaten with roasted peaches and cherries. this flourless peanut butter chocolate cake is something straight out of my dreams. desperately adoring this sweet potato, black bean and corn salad because MAPLE LIME vinaigrette. oh my. i don’t even know how to control my emotions when it comes to this s’mores brownie brittle. what the what. my waffles last week feel quite inferior to these everything bagel waffles. my favorite!! vegan coffee smoothies sound like an excellent idea. doing this with coconut milk. i’m tossing around the idea of using pluots, but i’m super into this plum galette. and the crust, darnit. just HOW does this exist. chocolate marshmallow rice krispie treat ice cream eeeeep. easiest lunch ever: may just be these smoked salmon and avocado summer rolls. could banoffee pie get any cuter?! i didn’t think so. on the menu this weekend, a lime rosé spritzer. let’s do it. 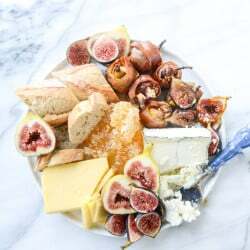 Goat Cheese Stuffed Figs and an Easy Summer Cheese Plate. 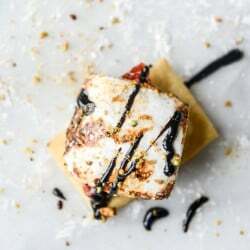 Savory Open Faced S’mores with Pistachio Marshmallows. School starts on Wednesday for us. I had so many plans to get little welcome back to school gifts for the teachers put together weeks in advance, but it’s looking like I will be up until midnight the night before, just like every other year! I still can’t believe it’s already time for back to school though. Every other year they have gone back the last week of August. *Sigh* back to reality! Those bagel waffles look pretty awesome, they might just give me a reason to buy everything bagel seasoning. And the jam recipe doesn’t require any actual canning, so I have no doubt that you could easily whip up a batch. Although, water bath canning is extremely easy, it’s just time consuming. Pressure canning is a little more tricky and since you use pressure canning for low acid foods and meats, you need to be very precise on everything, nothing kills a friendship like giving someone botulism! School here doesn’t start until September 8th, which means we still have some summer left. The chocolate peanut butter torte looks delicious. Your baby Max is just the sweetest! Thanks for sharing these great “crushing on” items. I pinned that salad for later! AHH OMG thank you so much for featuring my flourless PB chocolate cake! You know I normally check this first thing every Saturday morning (including my wedding day lol!) but this morning I OVERSLEPT and was racing all over the place before I went to volunteer all day at a children’s health fair. I’m so totally exhausted and came here because I missed my morning ritual and saw this! Thank you so much, it means so much to me!!! Also I’m freaking dying over that plum galette! I’m a teacher in Louisville, Ky and we started back this past Wednesday. We used to start later toward the end of August, but the past few winters we’ve had so many snow days & other natural disasters (i.e. flooding) that we weren’t getting out of school until mid-June. Now they’ve added in five extra days (in case of snow), and we are supposed to get out at the end of May. Fingers crossed for less than 5 snow days this year! I second that: I need regular trips to Target to spend too much money, buy things I don’t need, and to generally feel complete. Wooooohooooo! Hooray for baby Max update!! This photo is amazing! I want to be there. Right now. Thanks for the mention :)!! Pluots would be lovely as well. Do it! !